Good day mate! With its temperate climate and reverse seasons, Australia is a year-round holiday destination, filled with sunshine and packed with plenty to do for both outdoor enthusiasts and city sophisticates. From snorkeling and surfing to shopping and dining, Australia offers something for everyone. 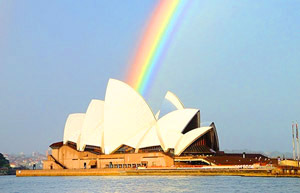 Savor fine dining, climb the Sydney Harbour Bridge, or take a backstage tour of the famous Opera House. All are possible in the visitor-friendly city of Sydney. When its time to leave the well-trodden tourist trails behind, head westward to the Blue Mountains and unlock a piece of Australia you never knew existed. With its beautiful boulevards, gracious parks, and elegant architecture, Melbourne, the capital of Victoria, is Australia’s most European city and one of the easiest to navigate. A free tram service loops the downtown, water taxis ply the Yarra River, and buses go just about everywhere and run often. 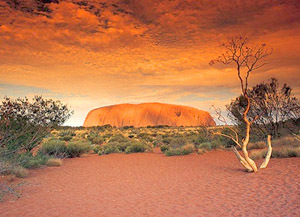 Experience the “real Australia” in the vast, rugged land of the Northern Territory. Home to Australia’s nomadic, artistic, and deeply spiritual Aboriginal people, sites such as Uluru, Ayers Rock, date back thousands of years and are decorated with paintings & carving from the native tribes. The Great Barrier Reef, stunning Gold Coast beaches, and luxurious resorts make Queensland an unparalleled tropical jewel. For a mountaintop experience, take the Kuranda Rail up one of Far North Queensland’s most impressive peaks, or travel over the rain forest by gondola. One of Australia’s best-kept secrets, offering exceptional wineries, gourmet cuisine, colorful festivals, and unspoiled landscapes. Barossa Valley, the famous wine region, includes more than 60 wineries and an array of quaint hotels. 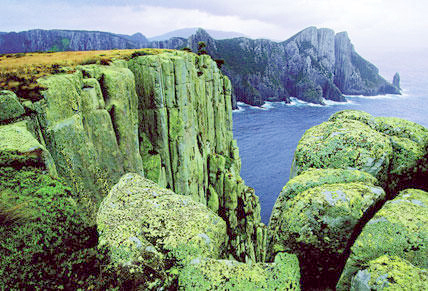 Off the coast, Kangaroo Island captivates visitors with turquoise seas, native forests, and exotic wildlife. Getaway to luxury, adventure, World Heritage wilderness, fine food and wine and boutique accommodation in Australia’s southernmost state. Home to the cleanest air in the world, Tasmania is just an hours’ flight from Melbourne and two hours from Sydney. Unique wilderness plus and authentic Aussie outback experience. Plenty of extraordinary vacation opportunities from exploring beautiful forests to whale watching, fine food and wine to world class surfing. This tour starts in Melbourne with it’s Victorian highlights and continues on to Ayers Rock in the Outback. From there you are off to cruise the Great Barrier Reef and finish with cosmopolitan Sydney and an amazing harbor tour. A transfer is included from Melbourne Airport to your hotel. You’ll see a lot of Melbourne on a sightseeing tour of the city, including a visit to the Melbourne Museum, a guided walking tour to discover the real city (and its amazing coffee) along its distinctive laneways, the Shrine of Remembrance, and the Royal Botanic Gardens. Take a morning flight to the heart of Australia’s desert Outback, arriving at Ayers Rock (Uluru) for lunch and an overnight stay at Sails in the Desert in the country’s “Red Centre.” This afternoon, meet local Anangu artists who share their traditional Aboriginal art with you during a workshop at the Maruku Arts Center; learn about the ancient symbols of the desert, and create your own art to take home! This evening, enjoy champagne and canapés as you watch the light of the setting sun bathe mystical Uluru with a palette of ever-changing color. Aboriginal traditions define life in the Outback, especially at Ayers Rock; learn about the “dreamtime” legends associated with this massive monolith on a guided tour. 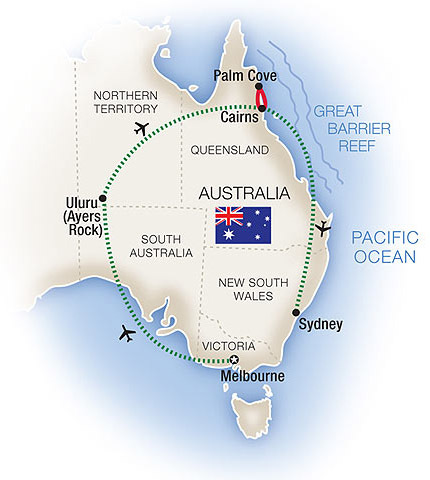 After lunch, fly to Cairns in Queensland, gateway to the amazing Great Barrier Reef. Board a gondola on the Skyrail Rainforest Cableway for a ride through the mist-shrouded rainforest canopy with your Ranger guide, including stops at Barron Falls and Red Peak. Arrive at The Reef House, your luxury beachfront resort in Palm Cove on the Coral Sea, for a three-night stay. Spend a full day exploring one of Earth’s most incredible “living” sites, the Great Barrier Reef – a UNESCO World Heritage Site and the only living structure on Earth visible from the moon. You’ll cruise to the Agincourt Reef today, at the edge of Australia’s Continental Shelf. 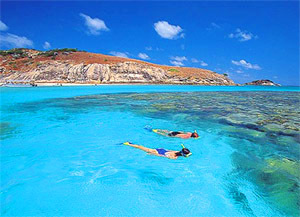 Enjoy unbelievable swimming, snorkeling and marine views with superb underwater visibility. Spend the evening at leisure back at your beachfront resort. Have an amazing day in and around Port Douglas in tropical North Queensland! 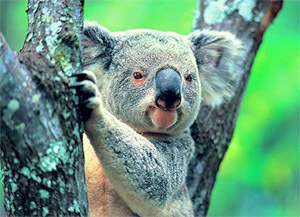 In Kuranda, explore the Koala Gardens and the Butterfly Farm. Learn everything you’ve ever wanted to know about crocodiles with a tour, a special crocodile feeding presentation, lunch and an exclusive boat cruise on the lagoon. Back at your resort, the evening offers an exclusive sparkling celebration of Tjapukai aboriginal culture, including canapés and cocktails, a traditional fire-making ceremony performed by Tjapukai warriors, dinner and an interactive dance show. Soar over the Atherton Tablelands on an optional early morning balloon ride or spend the morning at the resort at your leisure. Everyone takes off for Sydney late this morning for a four-night stay in the heart of the city. Your hotel overlooks Sydney Harbour, near the Sydney Opera House and within walking distance of the Royal Botanic Gardens, shopping and restaurants. One of Australia’s most famous iconic sights takes center stage today when you visit the amazing Sydney Opera House on a personally guided tour. A private luncheon cruise on Sydney Harbour is a fabulous way to unwind and relax, while getting a good look at some of this extraordinary city’s landmark sites from the water. Sydney sightseeing continues as you view The Rocks, Kings Cross and other highlights on a city tour. Accompanied by an informative local guide, head to Sydney’s Featherdale Wildlife Park for a visit with some of Australia’s native animals, as you watch resident koalas dine on eucalyptus leaves and just be their adorable selves this morning. Then taste your way through some very cool culinary nooks and crannies on a Sydney “Foodie Tour” to a variety of local eateries including an Italian deli, chocolate shop, fish market, a post-WWII pie-cart-turned-café, and a 150-year-old pub with a craft beer tasting. Today is yours to explore more of Sydney, your way. There is so much to see and do here – from museums to shopping, from Aboriginal art to an array of historic sites that tell the story of Australia’s earliest days, Sydney’s got it all! 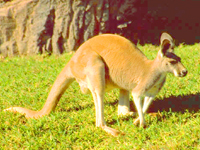 Cap the day – and this most memorable of Australia tours – with a farewell reception and dinner tonight. Fly home anytime or extend your vacation with a trip to New Zealand or a cruise. 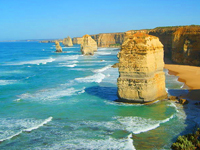 Your ultimate 21-day Australia & New Zealand tour includes desert Outback, tropical rain forests, a four-mile beach, coral reefs, glacier-capped mountains, dramatic fjords, and cosmopolitan cities. Bring plenty of film to capture the amazing sights of the Great Barrier Reef, the dramatic waters of Milford Sound, and the setting sun on Ayers Rock. 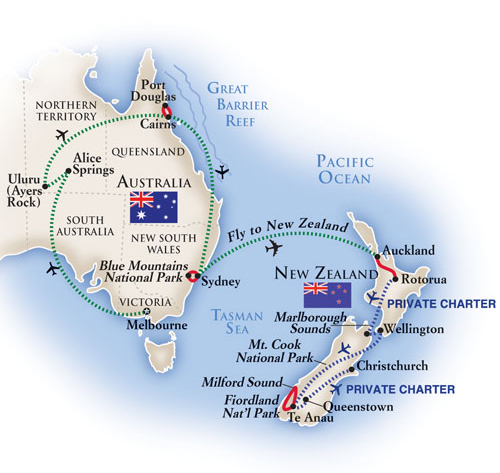 From breakfast with koalas to a green-lipped mussel cruise, a jet boat ride, a formal garden tour, silver service elegance in the Outback, and a private Maori cultural experience, you’ll experience a great taste of Down Under life enhanced by exclusive business-class charter flights throughout New Zealand!